Apologies for our radio silence after last week’s debacle in Chapel Hill. With the beginning of spring break, travel plans and general malaise were enough to de-motivate us from facing reality. UNC won the ACC regular season. They earned it. They rushed the floor. They partied. Good times. But it is now officially March: the college basketball postseason is upon us. Some teams have already punched their tickets to the Dance, including my hometown heroes UNC-Asheville Bulldogs. The Big East Tournament has been as wacky and wild as we have all expected, with the UConn Fightin’ Kembas putting a dagger in the heart of Pittsburgh. In a bizarre turn of events, Miami erased a 10 point Virginia lead in 42 seconds and advanced to the second round in Greensboro. March…the month of heartbreak and jubilation. And Duke Blog March Madness Pools. 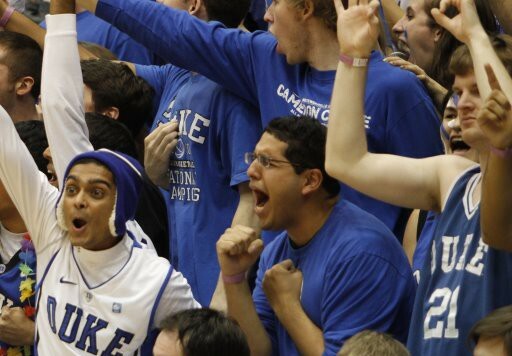 What can we expect from Duke tonight? Hopefully rested legs, a renewed sense of urgency, and a little bit of anger. We simply played scared against the Tar Heels, allowing them to shoot a blistering 53% from the field. Clearly that’s not acceptable anymore. With six days of rest and preparation—and hopefully some stern, instructive speeches from K—the Blue Devils are ready to play hungry again. With Notre Dame’s absolute obliteration of Cincinnati last night, the Fighting Irish are in prime position to usurp our #1 seed. The only possible way to regain it? Win our third straight ACC Tournament Title. Let’s get it. Several of our staff will be jostling for tickets to tonight’s game, so we’ll hopefully have some eyewitness reports tomorrow morning. Stay tuned. And Spear the Turtle.